The UnMuseum - 2012: The End of the World? 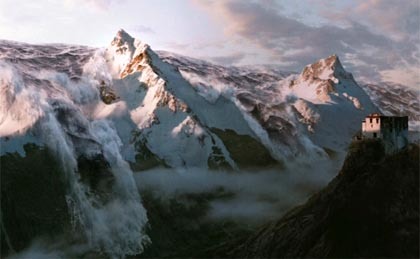 A tsunami rolls over the Himalayan Mountains in the new film 2012. Books, internet sites and now even a major motion picture suggest that bad things are going to happen on December 21, 2012. Is any of this craziness based on scientific fact? Enter December 21, 2012 into any web search site and you will come up with thousands of results. Some of these websites will be filled with predictions that this date will be the end of the world. Other websites will predict that there will be a shift in global consciousness. Also, you'll find websites that want to sell you books about the coming 2012 catastrophe. Finally, there will even be websites willing to equip you - for a price - with all the survival equipment you need to live through 2012. What's so special about this date? The significance of the day and year goes back to the ancient Mayans. The Mayan civilization existed in Central America starting around 2000 B.C and continued till the arrival of the Spanish in the 16th century. At the peak of their civilization, which ran from about 250 AD to 900 AD, they were known for advanced art, architecture and mathematical and astronomical systems. The Mayans employed a number of different calendars to keep track of their days. For everyday dates they used a combination of a 260-day calendar and a 365-day calendar (something they referred to as the "Calendar Round") This was enough for most people to keep track of their daily lives. It could identify a single day over a period of 52 years which was a length of time longer than the average lifespan back then. For lengthier periods, however, the Mayans turned to what they called the "Long Count" calendar that had its starting point at what they considered to be the beginning of the world: August 11, 3114 BC. The largest cycle on the Long Count lasts 5,126 years and will therefore end on the equivalent of December 21, 2012 on our Gregorian calendar. 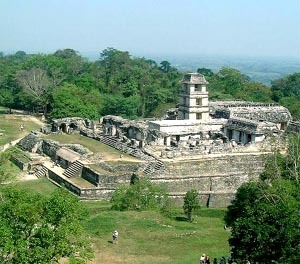 (Some Mayan scholar argue that the end date is actually a few days later on December 23, 2012) That date in 2012 also happens to coincide with the winter solstice (shortest day of the year). The significance of the end of this cycle to the Mayans is something on which scholars are divided. While traditionally the Mayans sae the an end of a cycle as an opportunity for celebration and feasting, sometimes, like at the end of the Calendar Round, these changes might be greeted with concern as the Mayans thought that the gods might not grant them another 52 years. According to Mayan creation accounts the present world was preceded by other worlds, each created by the gods and later destroyed by them. Some New Age authors have suggested that the end of this cycle will also signal the end of the world, though most scholars that seriously study Mayan culture and tradition disagree. Anthony Aveni, a professor of astronomy, anthropology and Native American studies at Colgate University, in an interview with CNN stated, "I think that the popular books... about what the Maya say is going to happen are really fabricated on the basis of very little evidence." So what are some of the claims being made about what will happen in 2012? One theory has the world going through what is popularly called a "polar shift" involving a reversal of the earth's magnetic field. Currently, the magnetic field of the earth has the north magnetic pole in the Arctic and the south magnetic pole in the Antarctic. Supporters of this theory argue that a massive solar flare in 2012 will cause these poles to reverse. If this were to occur, it would be very disruptive to human society as much of our navigation equipment depends on the current orientation. There is also an argument that the shift in magnetic poles will also cause Earth's magnetic field to collapse for a period of time. This may cause the planet to be exposed to massive amounts of cosmic radiation. The radiation in turn might cause the mass the extinction of plants, animals and people. Supporters of this prediction point to studies made by scientists that show that the magnetic poles have reversed many times in Earth's history. Sometimes they stayed in one orientation for tens of millions of years, other times they switched after only 50,000 years. The last magnetic field reversal was 780,000 years ago, leading some people to suggest one is overdue. In addition, the strength of the current magnetic field has been declining in recent years which supporters point to as a sign of imminent collapse. Scientists working in the field estimate that if the decline continues at the current rate, the magnetic field might collapse, not in 2012, but between the years 3000 and 4000 A.D.. However, the strength of the magnetic field has fluctuated greatly in the past and it is quite possible the field will regain strength without first doing a flip. There is also little evidence in the fossil record that a flip anywhere in the past has led to a mass extinction, so even if a reversal did take place it might well be disruptive, but not catastrophic. Another popular 2012 theory is that a polar shift in the magnetic field might lead to a polar shift of the actual axis of the earth so that the crust of the planet would no longer spin west to east, but say, north to south. Supporters of this theory picture these events taking place in weeks or even hours with massive earthquakes and humongous tsunamis wreaking havoc across the planet. There is some scientific evidence of such a change in Earth's past. Geologists Adam Maloof of Princeton University and Galen Halverson of Paul Sabatier University in France say that around 800 million years ago the North Pole was 50 degrees further south than it is today. However, the change to the new, more northerly pole position took about 20 million years to happen. While this is startlingly fast on the geologic scale of time, it is an eternity from the point of mankind's existence. There is nothing in the past record of the earth to support the idea of a rotational polar shift that would take place in a time scale that would be noticed by humans. Another theory floating around involves a planet called "Nibiru." According to this theory the planet, reportedly about 4 times the size of Earth, will pass close by our planet in 2012 causing earthquakes, tsunamis and a possible rotational polar shift. The only problem with this theory is that the existence of Nibiru wasn't discovered by an astronomer with a telescope, but by a woman named Nancy Lieder who claims the information about the planet was implanted in her head telepathically by extraterrestrials. In addition, Lieder and several other authors originally predicted that Nibiru should have destroyed Earth in 2003 - which it didn't - which makes their future claims of a collision a bit suspect. No legitimate scientist argues for the existence of Nibiru and many point out that a planet as large as described at the distance described should be easily visible in our skies. Its gravity would also affect the orbits of most of the other planets in our solar system. Neither of these things have happened. Astronomer Mike Brown often gets emails from people who mix Nibiru up with Eris, a real dwarf planet he discovered in 2005. Eris, however, is much smaller than Earth and never gets much closer to our planet than the orbit of Neptune. 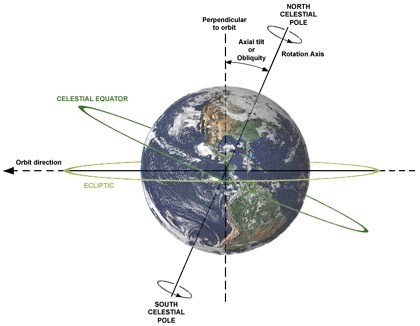 Some authors have connected 2012 with the alignment of the earth and sun with the galactic equator during the earth's winter solstice (referred to by some writers as the "Galactic Alignment"). This happens every 2,000 years or so and some books claim that the Mayans were aware of the event and gave the date a special significance (In astrological terms this transition is sometimes connected to the beginning of the "Age of Aquarius.") Supposedly it is a time which will harbor not disaster, but peace, enlightenment and understanding. Skeptics, however, argue that this arrangement of the sun, earth and galactic equator, does not occur on during single day or year, but across a span of 36 years. They also note that the most precise alignment actually occurred over a decade ago in 1998. So, if there is little real evidence that there is something special about the year 2012, how come there is so much concern about it from the general public? Part of it might be traceable to the website of The Institute for Human Continuity (http://www.instituteforhumancontinuity.org/). According to the website the mission of the IHC is to ensure the survival of the human race beyond 2012. The website is filled with information about the upcoming disaster and even includes a lottery you can enter to be one of the humans included in their "safe haven" communities designed to survive the catastrophe. The IHC, however, is a totally fictitious organization created as a part of a marketing ploy for the motion picture 2012. The film, from Sony Pictures, is based on many of the inaccurate ideas surrounding 2012 and uses special effects to effectively depict the end of the world. The movie is by the same people who have brought mankind to the edge of extinction in The Day After Tomorrow and Independence Day. 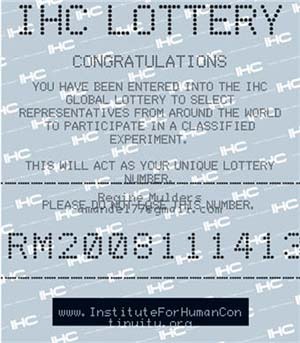 An IHC lottery ticket: Actually a clever gimmick for the film 2012. But is the advertising irresponsible? 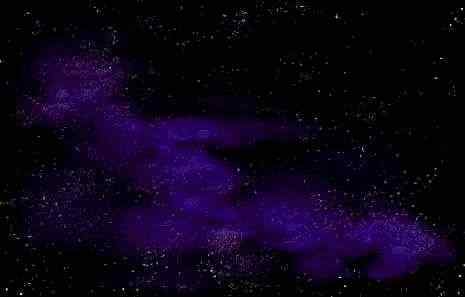 In his blog, astronomer Mike Brown suggests that publicity for the film, especially the IHC website, may be effective, but irresponsible. Is it perhaps it is panicking people unnecessarily about the future of the planet? The year 2012 isn't the first time people have worried about the world ending. The beginning of the current millennium, 2000, was of great concern for many people (especially as there was an actual chance of some computer systems failing with the Y2K bug). 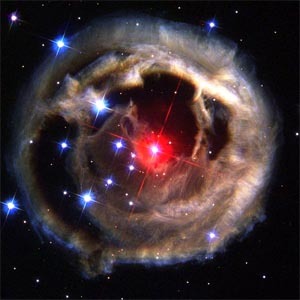 Then the world was supposed to be hit by Nibiru in 2003, and of course it wasn't. Even as far back as 1910 people feared that Comet Halley's tail would poison the planet's atmosphere with cyanogen gas. The earth will live through 2012 as it did through all of these previous incidents and in 2013 the public will get on with their lives, except those who will be writing books about the next great disaster. Copyright Lee Krystek 2009. All Rights Reserved.